Mangalore, Sep 5, 2014: Spreading the life story and messages of Swami Vivekananda to the children through a puppet show was an admirable way. 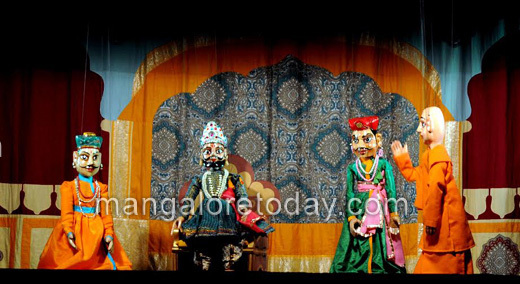 A team from ’Bharatiya Lok Kala Mandal’ from Udaipur in Rajasthan, effectively presented a puppet show on Swami Vivekananda at Ramakrishna Mutt premises on September 4. The troupe of 13 members worked for 8 months on the project and used 72 puppets. Two shows, each of one hour duration, were organised by Ramakrishna Mission, New Delhi, in association with the Ministry of Culture. A powerful narrative technique was used in the show, where the life and message of Swami Vivekananda is delivered through the conservation between a grand father and his grand son, making it interesting. Grand father explains the lessons of courage, integrity and conviction of Vivekananda to his grand son Naren through various anecdotes. Vivekananda’s childhood as Narendra or his youthful days or his address at the Chicago world parliament of religions, the basic moral lessons of life are told to the audience in an effective way. In one of the incidents, child Naren develops a kind of guilt for not having helped a road accident victim. When he converses about it to his grand father, grandpa defines ‘Karma’ philosophy in a simple way by giving example of Vivekananda’s courage and presence of mind. The stories of Vivekananda transforms Naren to be a better human being, thus giving a message to the young minds to follow the preachings of Vivekananda. Advanced sound and light techniques used in the show made it an enjoyable and learning experience to students. 213th show. Interacting with media on the sidelines of the show, Bharatiya Lok Kala Mandal Assistant Director Govardhan Samar said that the show on Swami Vivekananda organised at Mangalore was the 213th one. The show has been scripted by Laique Hussain and is directed by late Shyamali. 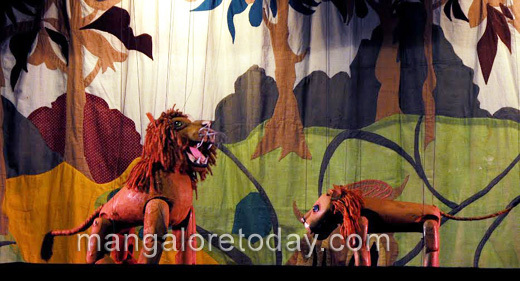 “We are using 72 puppets in this show and have worked for eight months on it, with a budget of Rs 30 lakh. The team has already performed in several states including Maharashtra, Rajasthan, Gujarath, Delhi, Uttar Pradesh, Manipur, Andhra Pradesh and Tamil Nadu. Our next performance will be in Belgaum and we have had shows at Bangalore and Mysore,” he said. 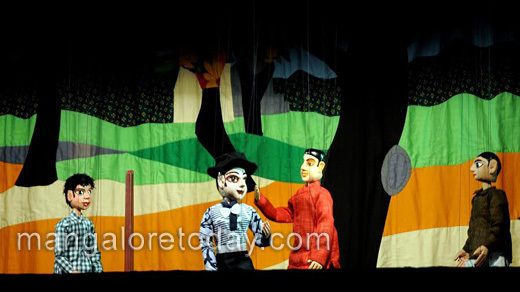 On puppetry losing its popularity, Samar said that Mandal has been experimenting with the shows, be it with sound and light, manipulation of stories or by adding music and dance to appeal the audience.